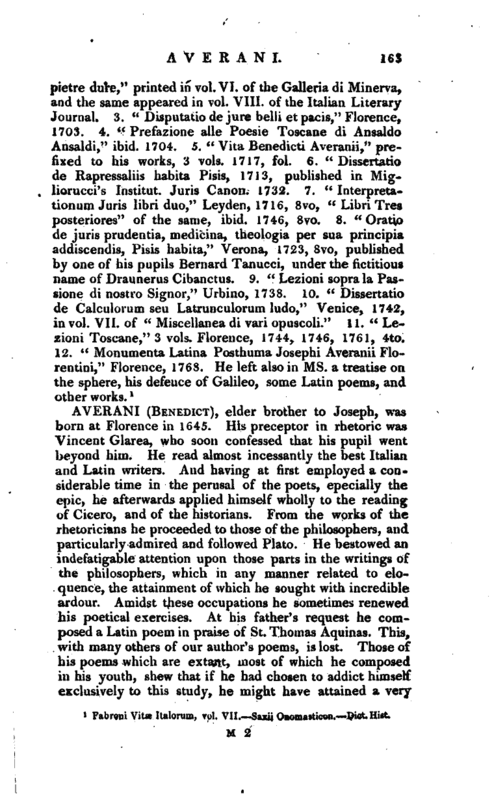 was born at Florence the 19th of March 1662, the youngest of the three sons of John Francis Averani. Benedict, the eldest, made himself famous for his eloquence and the thorough knowledge he had of the Greek and Roman classics while Nicholas, the other brother, so greatly excelled in jurisprudence and all kinds of mathematical learning, as to be reckoned among the foremost in those studies. Joseph received the first rudiments of learning from his father, after which he was put under the tuition of Vincent Glarea, a Jesuit, who then gave public lectures on rhetoric at Florence, with whom he made uncommon progress. He was taught Greek by Antonius Maria Salvini, and advanced so rapidly in his studies, that, in a short time, whether he wrote in Italian, or Latin, or Greek, he shewed an intimate acquaintance with the ancient writers. Young as he was, however, he did not | confine himself to oratorical performances alone, but exercised himself in poetry, for which he had much taste. 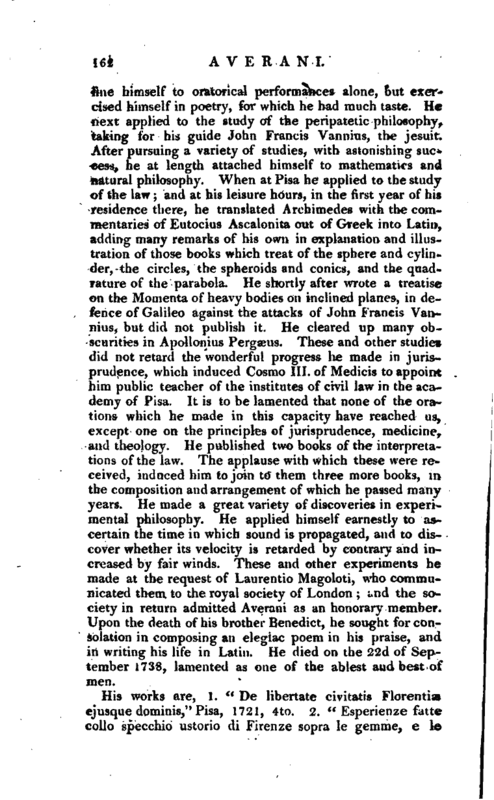 He next applied to the study of the peripatetic philosophy, taking for his guide John Francis Vannius, the Jesuit. After pursuing a variety of studies, with astonishing success, he at length attached himself to mathematics and natural philosophy. 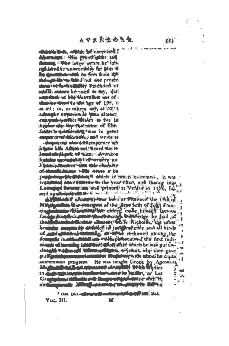 When at Pisa he applied to the study of the law and at his leisure hours, in the first year of his residence there, he translated Archimedes with the commentaries of Eutocius Ascalonita out of Greek into Latin, adding many remarks of his own in explanation and illustration of those books which treat of the sphere and cylinder, the circles, the spheroids and conies, and the quadrature of the parabola. He shortly after wrote a treatise on the Momenta of heavy bodies on inclined planes, in defence of Galileo against the attacks of John Francis Vannius, but did not publish it. He cleared up many obscurities in Apollonius Pergaeus. These and other studies did not retard the wonderful progress he made in jurisprudence, which induced Cosmo III. of Medicis to appoint him public teacher of the institutes of civil law in the academy of Pisa. It is to be lamented that none of the orations which he made in this capacity have reached us, except one on the principles of jurisprudence, medicine, and theology. He published two books of the interpretations of the law. The applause with which these were received, induced him to join to them three more books, in the composition and arrangement of which he passed many years. He made a great variety of discoveries in experimental philosophy. He applied himself earnestly to ascertain the time in which sound is propagated, and to discover whether its velocity is retarded by contrary and increased by fair winds. These and other experiments he made at the request of Laurentio Magoloti, who communicated them to the royal society of London i.nd the society in return admitted Averani as an honorary member. Upon the death of his brother Benedict, he sought for consolation in composing an elegiac poem in his praise, and in writing his life in Latin. He died on the 22d of September 1738, lamented as one of the ablest and best of men. 1 Fabroni Vit Italorum, vol. VII. —Saxii Onomasticon.—Dict. Hist.